It's a basic place good for one night. The bedding made my indoor allergies flare up and the mattress was noisy and uncomfy. Location is great. Negative review: lack of bathrooms / Watercloset; you can see how people struggle to catch one free. Ourselves, we had to wait in the morning more than half an hour. The staff was really nice and it was in a great location. However the beds were very uncomfortable. overall a good hostel, but beds were very worn out and uncomfortable. Other guests who seemed to have been there for much longer were not nice or accommodating at all. Each floor has one single bathroom to share and the kitchen is very small, not ideal for shared breakfasts in the morning. Staff were otherwise very helpful. Rooftop terrace is a nice place to hang out. I sadly cannot recommend this hostel to anyone who wants than just a bed. The location is great and it’s perfectly clean etc. There are some small issues with facilities, eg the rooms are so small that it was difficult to fit 4 people’s stuff and ther aren’t enough bathrooms. However my main complaint is about the staff + atmosphere. At best the staff were unhelpful but often they were actually rude. There are no activities or any way to meet people and the staff don’t make any effort. 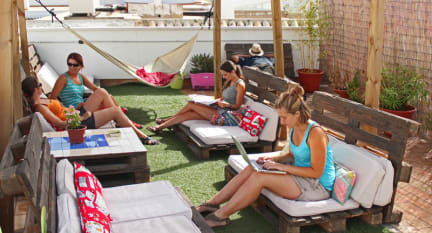 I was really excited to go to the Cadiz Inn backpackers hostel to see the city and take some surfing lessons. However when I came there a staff member told me that we couldn't surf there, so that was a big bummer. Furthermore there was literally no social atmosphere and all the communal areas, the terrace and even the kitchen closed at 10. there were also only 4 bathrooms for the whole hostels and only 3 of them had working showers. But there was this one staff member a guy that was really nice! More of a hostel motel than a backpackers hostel, all social areas close at 10, mainly older Spanish couples here and the front door was wide open most of the time. This plus the lack of bathrooms (2 showers for the entire hostel) and the poor condition of the rooms and means avoid if you can.